Okay, I just really wanted to say that, I know it’s silly. :) But it’s a really fun morning for me, because I’m teaming up with Mrs. Fox’s Sweets for another holiday link party! 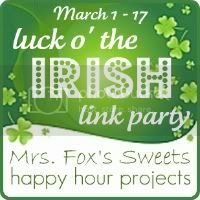 I sure hope you’ll take a moment to link up your St. Patrick’s Day projects, recipes, and activity ideas so we can all get a little inspiration! Links added here will be visible at both our blogs, so it’s double-exposure for you. Grab the button if you would like, and everyone loves new followers, but we hate to take the fun out of this by adding rules and requirements for linking up. It would be very sweet of you to drop by my co-host’s blog to say hello – Christina does some amazing decorating over at Mrs. Fox’s Sweets! But we are easy to please; all we ask is that your links are appropriately-themed! Don’t have anything Irish to add right now? That’s okay! Come on back at 5:00, when Freestyle Friday opens for the weekend, or come on back anytime now through St. Patrick’s Day to add your posts! Thank you for hosting and giving a place to put all of my St. Patrick's Day projects!